It’s nice to say that we begin 2012 with excitement about Chapel Hill 2020 — and REALLY MEAN IT! The plan our stakeholders create will take us well beyond the year 2020 in our vision for a sustainable, vital community. The lineup of January presentations is outstanding — health care, retail, housing, economic development, demographics, transportation, Carolina North, and a day devoted to innovation. 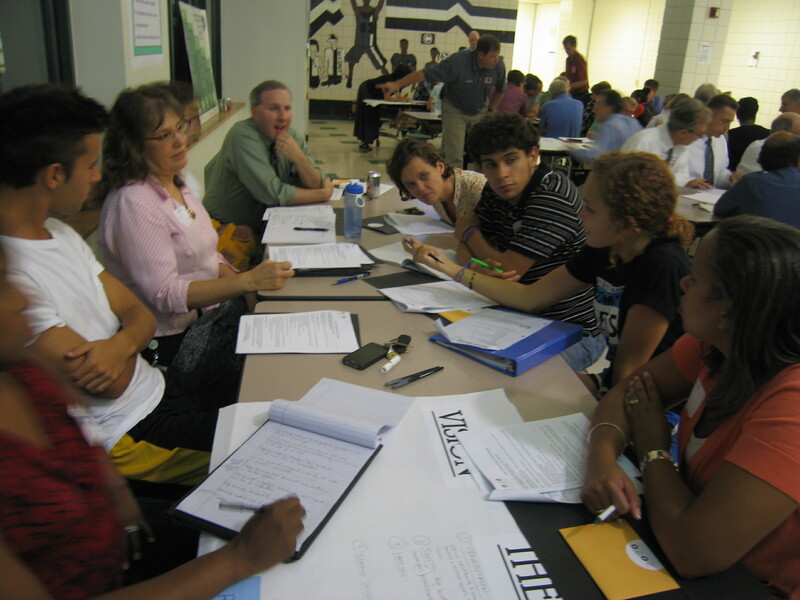 The six Theme Groups meet next at 4:30 p.m. January 12 at Glenwood Elementary School; groups then may establish a “final draft” of their goals. We’ve reviewed the draft goals, dropped in on discussions, and we are impressed. We see new thinking; strong knowledge of our community; practical requests for resources and information. Our stakeholders envision a more holistic plan than the current comprehensive plan — for example, promoting public health and local food sources; exploring economic development and innovation; drilling down on greater waste reduction; staying mindful of our fiscal constraints. More than land use, indeed! As co-chairs of Chapel Hill 2020, George and I draw on our past experiences and our contemporary conversations to identify potential Big Issues, which we call the “Big Rocks” — important topics the plan should address. After reviewing the work to date, listening and thinking, we ask the community to consider whether these issues might qualify as Big Rocks, needing attention from our Theme Groups, and a place in the plan. Some stakeholders have asked in meetings and blog posts, how can we include the schools in our planning? We agree. Any way you cut it, our schools are a major determiner of our community. They relate to the community’s desirability, population, tax rate, real estate values. The Chapel Hill-Carrboro school system is a major employer. Do they have new site needs? Should we encourage them to grow up (on existing sites) and not out (on new sites)? What about year round school? Are the town and schools maxing out opportunities to share facilities — and save money? If you own a home in Chapel Hill, 32 percent of your property tax bill goes to the Town of Chapel Hill to fund the Town’s operating budget. The balance of your bill is split between the County (56 percent) and the School District (12 percent). Considering that half of the county budget goes to schools, this means that 40 percent of a what a Chapel Hill homeowner pays in taxes goes toward schools. Our local public school leaders are developing a new strategic plan. We will have a presentation from them on their key issues on February 2nd at 5 pm. “Nurturing Our Environment” has addressed solid waste from some perspectives. In fact, we have a Big Ugly Rock in this road and it is within sight. Orange County assumed management of the countywide solid waste system in 2001. Yet at the dawn of 2012 the county has not settled on a solution for future waste disposal. The landfill closes in 2014. Absent a county solution, should Chapel Hill be seeking its own solution for this important public service? Read that “Police Station.” The current home of the Chapel Hill Police Department is a disgusting, inefficient, poorly designed, ugly facility. Mold. Hot water problems. It is an embarrassment. If you doubt this let us take you on a tour. Council has identified it as a priority but no money is budgeted toward a new home for our police. The other key capital need Council has identified is programming space for Parks and Recreation — for dances, arts classes, etc. We hope a Theme Group (or two) can fold this into their thinking. Creative solutions? Existing spaces we can adapt for classes and dances? And there’s an underused asset — the old library on Boundary Street. What should be its future? At our initial visioning session with 475 people, “Downtown” was one of the most frequently occurring words. Scores of people cared about downtown, offered ideas, cited problems. How often do we hear, “I can’t find a place to park downtown so I don’t go”? Talk to any business owner downtown and this is Topic One. Either we need more downtown parking or a crackerjack educational program to tell people how to find existing parking. Or perhaps more creative partnerships with owners of private lots. We encourage our Theme Groups to give downtown the high level of attention the community desires. Last December 1, Town Manager Roger Stancil reported on the town’s fiscal condition. We learned that for this year the town had replaced funding for street maintenance from annual operating expense with the use of bond funds approved for street improvements. The bond funds will run out but the annual need will continue.. Our road infrastructure is an essential, valuable resource. Beyond function, it’s part of our image and face. We hope the plan will give town infrastructure a priority. In the early 1980s, Mayor Joe Nassif, Mayor Jim Porto of Carrboro and Commissioner Don Willhoit collaborated to purchase this 69-acre tract for a future landfill. The Greene Tract was disqualified as a landfill site but remains a publicly owned resource. It falls under both Chapel Hill’s and the county’s planning jurisdiction. We hope our 2020 stakeholders view this tract thoughtfully as a great public resource for the future. We can share that thinking with the county and Carrboro. We have extensive town-gown collaboration — transit, safety, the Downtown Partnership, planning. Can we explore ideas for town-gown collaboration in new development? Opportunities at Carolina North? Joint ventures with the private sector for new student and young faculty housing, either downtown or on transit corridors, so that they will have choices other than living in Northside or commuting from Durham or Chatham County? This is a sustainability goal looking for some outcomes. Here’s a question for “Getting Around” and “Good Spaces and New Spaces.” The current Land Use Management Ordinance has a “placeholder” page called Transit Corridor Development. Once upon a time (12 years ago) town leaders thought we should specify our transit corridors and what type of new uses and buildings, including scale, should be encouraged along NC 86 and NC 54, for example. Twelve years later, that page is still blank. Can we agree on a 2020 goal that allows us to finally write that page? We look forward to hearing from you at tomorrow’s meeting and here! Thanks for beginning tie all this together. Much still to work to do. The elephant – sitting as an invisible lump on many of these topics that I see missing is Carolina North – not just the physical plant itself but its impact on the town – traffic, housing, commerce. I’d like to believe that this process will lead to a corridor that is better thought out than 54. I think, like the land being discussed on the south side of town in relationship to BCBS, and the UNC Health System, that it will be tax exempt. Is that correct? Could we include its impact in our discussions? We are fighting the property rights-stripping trend of “Sustainable Development”, “Smart Growth” and Agenda 21. “The Plan recommends that one or more of the corridors identified as Rural/Scenic corridors be the subject of a specific corridor management plan that balances the visual and scenic appeal of a specific corridor or segment, with the development rights of current property owners.” hmmm, i guess I as a prop owner must GIVE UP some of my rights in order to serve the “greater good” – does this raise a red flag? Consensus = Commuinitarian = a nice way to say communism – Don’t you have to ‘take’ someone’s right away if the “majority rules” that it is best for the community?